A new report on Canadian finances shows the rich have nearly doubled their net wealth over the span of 13 years while the poor have -- you guessed it -- gotten poorer. 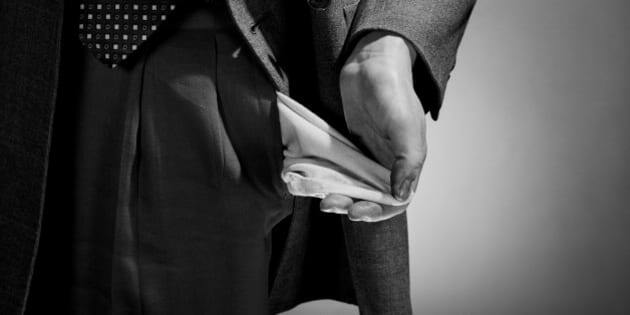 Statistics Canada’s survey of financial security, conducted between September and November 2012, revealed the poorest 20 per cent of Canadians have seen their median net worth remain unchanged since 2005, and decline since 1999. In 2012, the poorest one-fifth of Canadian families had a median net worth of just $1,100, the same as in 2005, and down 15.4 per cent from $1,300 in 1999. Meanwhile, every other bracket has seen its net worth rise. Canadians in the top three wealthiest brackets saw median net worth gains of over 40 per cent since 2005, and a whopping 80 per cent since 1999. Family units with a median net worth of $245,000 and over in 2012 are part of that group. The StatsCan report says differences in home ownership and private pension assets between the classes help explain the changes. Houses remain the largest asset for Canadian families, accounting for one-third of the total value of assets, the report said, followed by pensions. The richest 20 per cent of Canadians have seen their median net worth increase to $1,380,000. That wealthiest 20 per cent also held 67.4 per cent of the national net worth, the report showed, down slightly from 68.6 per cent in 1999. Overall, Canadian families saw their median net worth jump 44.5 per cent since 2005 to $243,800. Canadian families’ debt loads have increased from $13.06 for every $100 held in assets in 1999 to $14.21 in 2012. The report also shows family units in British Columbia had the highest median net worth, $344,000, more than twice than those in Newfoundland and Labrador, at $167,900, and Prince Edward Island, at $150,300.